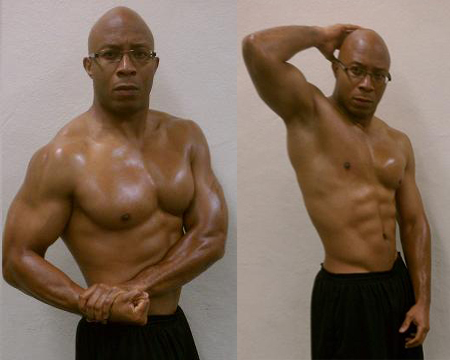 Herman Douglas placed 3rd in the Sixth Adonis Index Contest in the Open category. Herman was one of the most muscular guys in the contest. Herman was pretty surprised when he saw his back shot. Herman has been working out since 9th grade, so he’s a pretty experienced lifter. While he has a lot of experience in the gym, he was never in a really exceptional shape. And because he was afraid of losing all the muscle he ate a lot of calories that in reality prevented him from losing any fat. Herman is 5’9” and was always scared of being lighter than 200 pounds. Like he said, it is pretty ridiculous to think that somebody his height should weight that much. If you are working out that sort of weight can look good in a shirt that perception drastically changes when you take it off. For Herman it wasn’t until his wife took some pictures of him, especially of his back. Only then he realized how much fat really is on his body. Most guys never really care how they look from the back and focus on the mirror look only. When Herman saw that there is a lot of fat hiding from him or from what he can see in a mirror, he was really surprised. He thought he was in much better shape. After a friend introduced him to the Adonis Index he started to wonder if this new approach would get him some results. It still took him some time to get over the fact that he needed to drop not just 10 pounds, but really somewhere around 30 pounds of fat to get in decent shape. A lot of guys think that they need to get to 200 pounds and while it’s impossible for the vast majority of guys to be that heavy while being lean, there is no need for that either. If you think you need to get big and hit the 200 mark as soon as possible, you are looking at it from the wrong perspective. If so then stop focusing on getting bigger and rather take a look at yourself and concentrate on a specific shape and proportions. Shape and proportion are what matters and what will determine whether you are in good shape or not, not how much you weigh. There are several issues with using weight as an indicator whether you look good or not. Weight itself tells you nothing. Weight is directly proportional to your height. A 6’4” NBA player will have genetic potential for building more muscle mass than an average 5’10 gym rat. So setting up a weight goal without considering other factors just points out on a lack of perspective. Be different from other guys and don’t set your goal for weight gain, focus on the ideal shape and proportions instead. When Herman first heard from his friend that he should be 30 pounds lighter, he wasn’t ready or in a state to hear such advice. The idea of being over 200 lbs was still in his head and he was afraid of letting it go. He was happy with the weight and he looked good in clothes. He just didn’t want to admit to himself what was really going on. He, like many other guys was scared that what he believes may not be true and didn’t want to shatter his belief system. It took him a while, but seeing his friend getting in shape, he decided to give this new idea a shot and at the end he is glad he did. Once he got over the belief that he needed to be heavy, he could start eating less calories and actually lose weight. At first he needed to lose a lot, so he was eating roughly 1000 calories per day, however this was getting tougher every week and he was forced to raise his caloric intake and he gradually went from 1000 to 1800 over the next couple of weeks. And this is something you can expect to happen, if you have a lot of fat to lose (let’s say 30 pounds) then at the beginning you will be able to eat very low, however as you progress and get leaner, you will have to start eating more and more and slightly optimize to maintenance once you get to a single digit body fat number. This is of course all very personal, so you have to calculate your own caloric needs based on your BMR, physical activity, current weight and your goals. For Herman once he lost most of the fat he had on his body, he found his “sweat spot” around 1800 calories. This allowed him to push hard in the gym, while still being able to lose some fat and satisfy his hunger. Herman is 5’9” and did the Adonis Index workout and some additional cardio, so your number will be different, but the key is to calculate it and act according to it. Herman did some cardio, but as he got leaner and leaner he had to cut back on it because it just wasn’t sustainable. And this is important, find what works long term and stick to it. Even though extra cardio worked at the beginning when he had a lot of fat to go, as he got closer to his ideal waist, it got tougher and then he was faced with a decision – eat more or cut cardio. He decided that there is no reason to do more work for the same results, so he stopped doing the cardio and focus mostly on his diet. Before he was wearing size 36 pants and his knees and back hurt. Now he is wearing 33 and even that feels too big. Plus he is no longer scared of having heart problems like his father. He is healthy and he feels healthy. The best thing was that other people noticed this transformation and complimented Herman on his work. This was all possible only because he overcame his belief of being big and heavy. It’s not worth trying to be heavy, it’s a waste of time, unless you are 6’4’’ you are not supposed to be over 200 pounds and there is no reason to spend good years of life being overfat. Now when Herman gets in front of a mirror the only thing he can say is “wow, what a difference”. When you wear clothes, they just cover it up. Clothes hide the fat from your eyes and will trick you into believing that it is okay to be that big. The leaner you get the harder the fat loss will be. You will have to up your caloric intake a bit to sustain the diet. If people are used to you as the big guy and you suddenly start to lose weight, they won’t be very happy about it and might tell you that you are skinny or that it is unhealthy. Don’t listen to them, they don’t understand what you are doing and why you are doing it. And most importantly they are subcutaneously making excuses for not getting in shape themselves. If you decide to take professional photos, it will take you some time and trial and error until you learn all the proper posing, how to flex and hold the muscle, what lighting works the best, in what time of the day are your muscles most defined, expect it. The leaner you are the bigger you look. The fat mass and shirt has to come down for you to look bigger. While this sounds strange, it’s is true, it’s the muscle definition that creates the illusion that you are bigger.